Google adsense is full of breakthrough new. Google Adsense has just suggested to use the Dashboard version 3, which has long provided this version just recently the Google Adsense recommend to use the dashboard version 3, with the recommendation of the page after we successfully logged into your account. Not only the pc version of the update due to using mobile phones, we can also check the Google Adsense revenue. 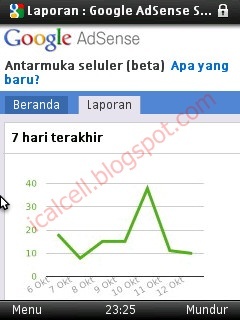 Ical has been use a long time the mobile interface features of Google Adsense. Ical light enough according to the terms of pageviews check ads and check earnings reports (daily, weekly and monthly), and also comes with a diagram. Note the picture below, when I use the mobile interface v3 Google Adsense via operamini browser. dah ane ikutin gan tutor ente. tpi gk sama ama screen shotya. Ane kan pkek PC kompter. Sdngkn ente kan pkek PC laptop gan. Jd binund ane gk sama.